How long since you enjoyed the relaxing feeling of having a good night’s sleep in a cosy bedroom? Who loves going into their inviting cosy bedroom and crawling between the sheets for a good night’s sleep? 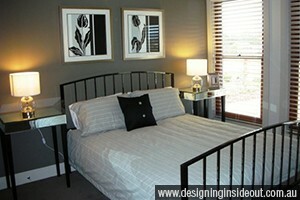 You want your bedroom to look and feel like a sanctuary, a place you go to get away from the day’s worries and woes. When planning the use of space you want to consider if this will be a space of your own or an intimate space you will share with your partner. If you have a bedroom that is not inviting, is drab or you absolutely hate the colour – then now is time to do something about it! Colour has a psychological impact, so you may want to ask how the paint colour you prefer makes your partner feel as well. Create a cozy atmosphere with beautiful bed linen, lamps for soft mood lighting, and artwork that adds interest and coordinates with your paint colour. Not quite right yet? Maybe a rug half under the bed, especially if you have timber flooring, will do the trick. Last but not the least, the finishing touches in accessories like photo frames, little container with greenery (try fake if you don’t have a “green thumb” like Michelle!). 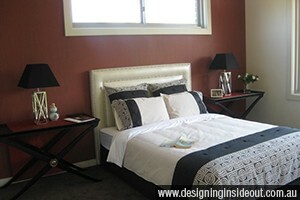 In the image above, we also used an industrial style wallpaper, but softened it with the furry throw! 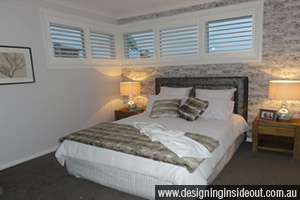 Windows can have shutters (as image above), or if you are on a budget – a simple roller blind with a modern textured sheer that will blow softly when the windows are open! 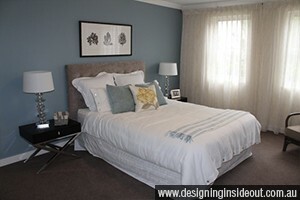 Want professional help to design your cosy bedroom or to find ideal accessories?